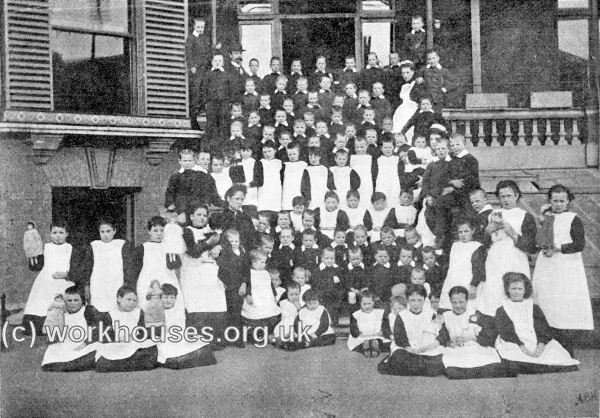 Kensington & Chelsea District School, Banstead, Surrey - a residential school for London workhouse children. Prior to 1876, the parishes of Kensington and Chelsea formed part of the North Surrey School District which operated a school at Anerley. However, a rapid increase in the population of the area resulted in Anerley being unable to cope with the demands being made upon it. Accordingly, Kensington proposed to found a school for its own children, then numbering around 200. The Local Government Board agreed to this proposal on condition that Chelsea should join Kensington to form a new joint Kensington & Chelsea School District. St Marylebone also joined the School District in 1920. Unlike the other Metropolitan School Districts at that time, Chelsea and Kensington decided not to establish a large "district" school. Instead, it opted for a cottage homes development at Banstead in Surrey, together with a "branch" or "intermediate" school in Hammersmith. The Banstead Cottage Homes were erected in 1878-80 to a design by A & C Harston and were described as giving the impression of "a well-designed model village, delightfully placed amid country surroundings of woodland and downs." The buildings occupied a narrow strip of land alongside a railway line, although the elevated position of the site was said to provide views of Windsor Castle. The layout of the site is shown on the 1894 map below. Banstead Homes from the south, 1879. The children's cottages were mostly named after trees. On the Boys side these were Ash, Beech, Cedar, Almond, Elm, Fir, Hazel, and on the girls' side Acacia, Chestnut, Drake, Jasmine, Laburnum, Larch, Laurel, Lavender, Lime, Maple, Oak, Pine, Thistle, and Willow. Banstead Homes from the south-west, 1950s. An account of the buildings from 1898 is given below. 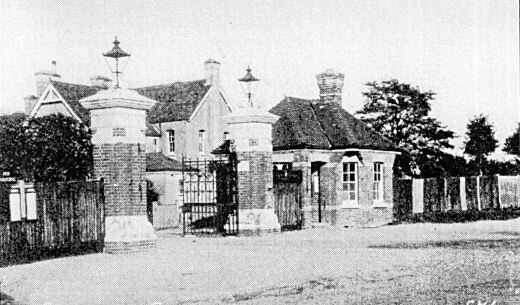 The entrance gates and porter's lodge are 50 yards from the middle of a fine main drive (about 600 yards in length), on either side of which are ranged the 23 detached homes or cottages for the children. 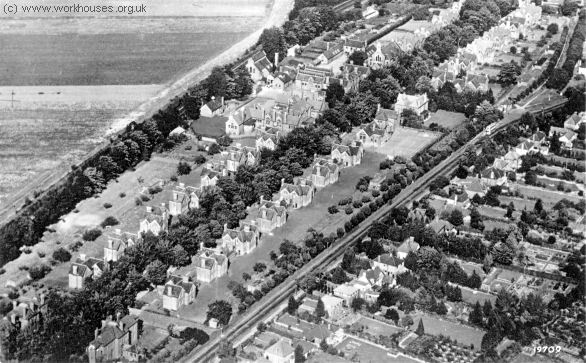 In the centre of this drive lie the administrative and school buildings, consisting of the residence of the superintendent and matron, a house for the school staff, the stores or "village shop," the bakery, laundry, and swimming bath; three schools, two on the north side for boys and girls (a new girls' school has just been added with a covered playground for boys and girls beneath it), and the other on the south side for infants, and the detached chapel. Banstead Homes boys' school plan. Immediately at the right of the entrance, are two probationary homes, one for girls and one for boys, together capable of holding 40 children, while further to the right, on either side of the drive, are the nine cottages for boys, with accommodation for 40 in each. To the extreme right, a fine bandroom, which is to form part of a future drillroom and gymnasium, has been lately erected at the cost of some 800l. 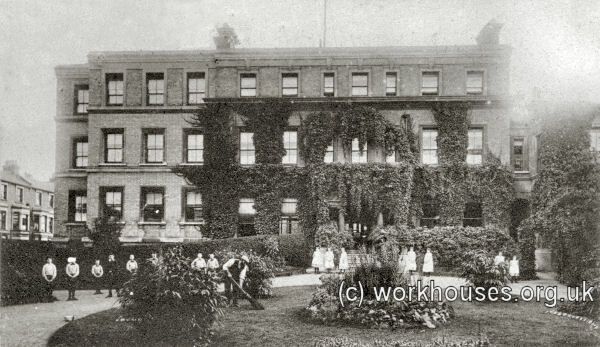 On the left of the entrance and central buildings, the 14 girls' and infants' cottages are ranged, with 26 beds in each ; again to the left of these, come the infirmary with 30 beds, and the infectious block with 18 beds; and beyond these blocks lie the present boys' playfield and a large kitchen garden. The nine boys' cottages are each under the charge of a house father and mother, the former acting as industrial trainer, while the mother attends to the domestic duties of the house and needs of the children. Generally speaking, boys are placed in the house of the father in whose trade they are being instructed, and some of the boys also assist in domestic work. Banstead Homes boys' house plan. The girls' cottages have small wash-houses attached to them, and some four or five of the elder girls assist the house-mother in washing, cooking, housework, mending clothes, and in looking after the infants of four to seven years of age, who are distributed equally in these cottages. Banstead Homes girls' house plan. Banstead Homes girls' cottage, 1902. 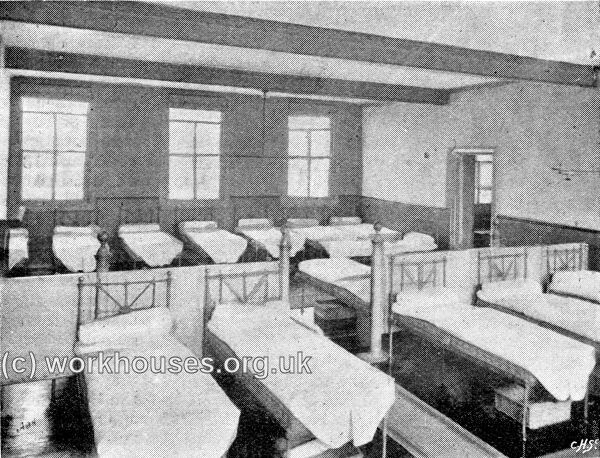 Each cottage contains on the ground floor a playroom, a sitting-room for the officer or officers, kitchen and scullery, a bath-room and lavatory in which the jet and trough system is in use, every child being provided with a separate towel, brush, and comb. On the upper floor are two dormitories, a linen-closet, and private bedroom. In front of each cottage is a little flower garden, and at the back a playground and kitchen garden. A supernumerary house-mother is in readiness to take charge of any cottage in case of the illness or absence of its usual head. The stores are supplied in bulk to each cottage from the central storerooms, meat, bread, and milk daily, and general stores weekly. At the outset, it was determined not to provide a general laundry, but to do all the washing in the small wash-houses at the girls' homes, but it was found impossible to carry out this plan, and a large laundry, with drying chamber, had soon to be erected. A covered swimming bath, capable of being steam-heated, for use at all seasons of the year, was included in this improvement. The chapel is a fine building, and can seat about 500 children, for whom the usual Sunday services are held. The workshops are roomy and well fitted. All the clothing is made on the premises. 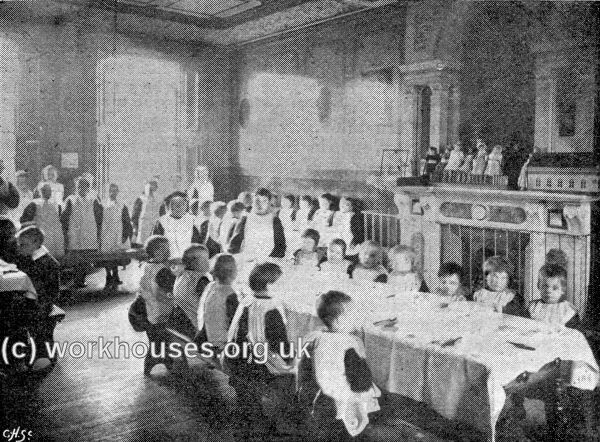 Children, are, on admission to Banstead, placed in one of the two probationary homes, where they are kept for two weeks, as a further precaution against the introduction of disease into the cottages ; they are then drafted into the several cottage homes, and recommence their school-life, which briefly is as follows:- They rise at 6 in summer and 6.30 in winter ; there is private prayer at the bedside, and common prayer in the dining room before breakfast, which is at 7.15 in summer and 7.45 in winter. After breakfast some have recreation, others perform various domestic duties. The elder children are divided into two divisions, and go to school and workshop on alternate days. At 8.30 the children in turn go to the workshops, and the school division to drill or physical exercises, and thence to school at 8.50. At 10.30 they have 15 minutes recreation. At 12 noon schooling, and also work in the shops, is discontinued, and at 12.30 they have dinner. Banstead Homes swimming bath, 1902. On one day in the week girls have physical exercise, 1.15 to 1.50, and boys the same during winter only ; in summer the boys have this on two evenings weekly, 6.20 to 7.20. School and work begins again at 2, with an interval at 3 for play. 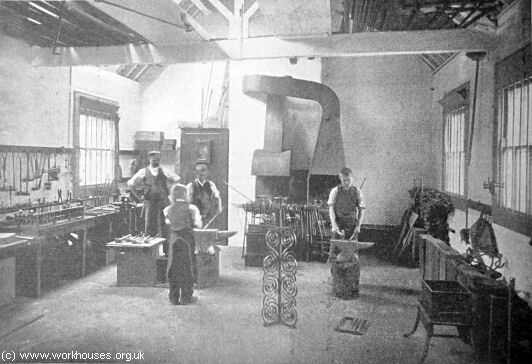 The school discontinues at 4.30, and the children's' work in training shops ceases at 5. In winter from 6.20 to 7.20 there is evening school for elder children, except on those evenings when an entertainment is given instead. Infants leave school at 11.30 and 4, half-an-hour earlier than the others. All have supper at 6 and common prayer afterwards. The boys and girls knit their own stockings, and mend and repair all clothing. Infants go to bed at 7, and the others at 8 in winter, and 9 in summer. The cottage father and mother take their meals with the children. The teachers play with the children in recreation time on the asphalted playground, which is fitted with swings and giant-stride. The children are inspected as to cleanliness, &c. before the commencement of morning and afternoon school. On Wednesday afternoons, all the school divisions go out walking under the care of their teachers. The elder boys are taught cricket and football, and are provided with suitable flannel suits and jerseys. Each girls' cottage is provided with a go-cart to assist the infants when long walks are taken by the cottage family. On Sunday, service is held by the chaplain in the school chapel, and morning and afternoon Sunday school is held for one hour. There is a circulating library of 656 volumes, which. the children are allowed to take to their homes to read. Banstead Homes children and house mothers, 1902. 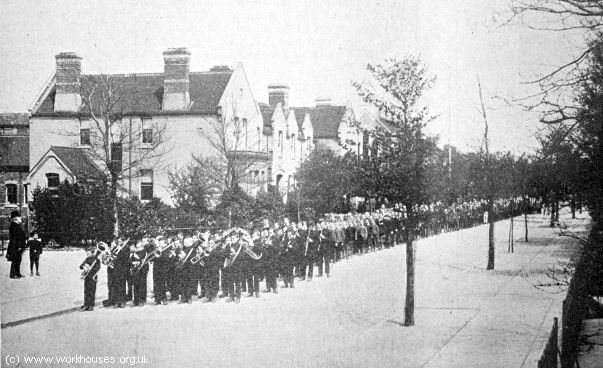 Banstead Homes band and parade, 1900. Sport was an important part of the homes' activities and its teams were successful in competition. In 1912 and 1913 they won the Monro Cup at the annual meeting of the Metropolitan Poor Law Schools Association at Stamford Bridge. 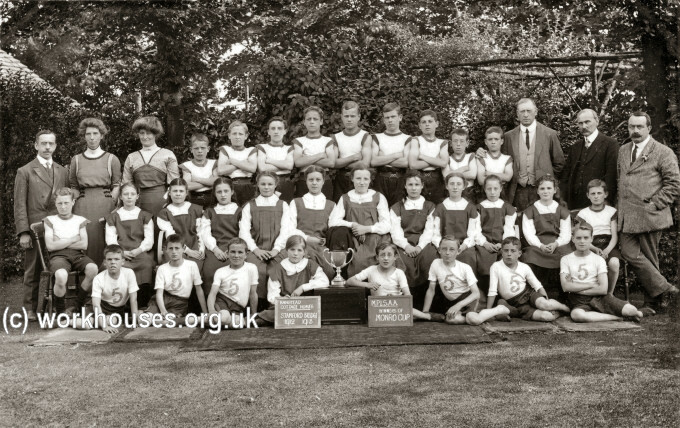 Banstead Homes athletics teams, 1913. The site was renamed Beechholme in 1951. Its operation was later taken over by Wandsworth Borough Council. 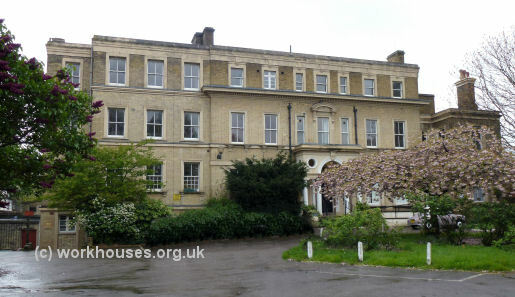 The school closed in 1974 and its facilities replaced by a number of modern houses located within the Borough of Wandsworth. The school buildings no longer exist and the site has been redeveloped as the High Beeches housing estate. Marlesford Lodge "intermediate" school opened in 1883 at a site on King's Street in Hammersmith, opposite the southern end of Ravenscourt Park. 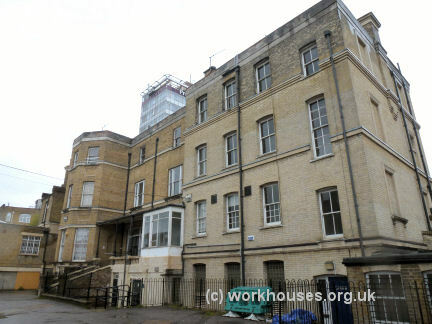 It accommodated around 132 children and was also designed by by A & C Harston. Marlesford Lodge from the north, c.1905. Marlesford Lodge from the south, 1900. Marlesford Lodge dining room, 1896. 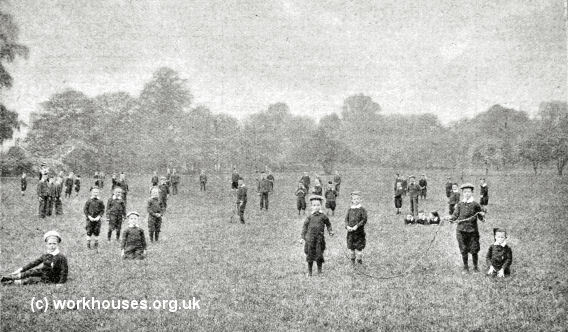 Marlesford Lodge children in the park, 1900. 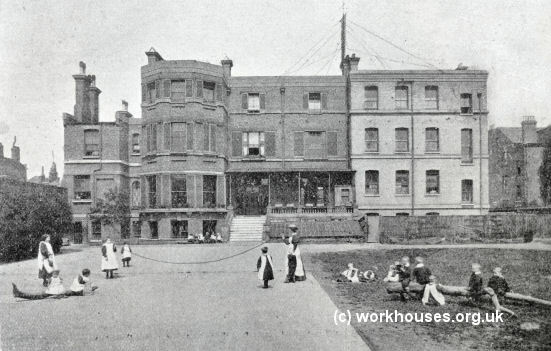 The site later became a home for 'mentally defective' children. In more recent times, the property became known as Palingswick House, accommodating a library and museum, and also housing a number of charities. In 2012, the site was sold to the West London Free School. Marlesford Lodge from the north-east, 2012. Marlesford Lodge from the south-west, 2012. Peter Eliot's Beechholme web pages.